Andrew Tashevski-Beckwith celebrates his match-winning goal. In an exciting bayside-battle at Burbank Oval, the Footscray Bulldogs have hung-on to defeat western rivals Williamstown on Sunday afternoon. The Bulldogs used pace and pressure to knock over the top-of-the-table Seagulls in a thrilling game that went down to the wire. 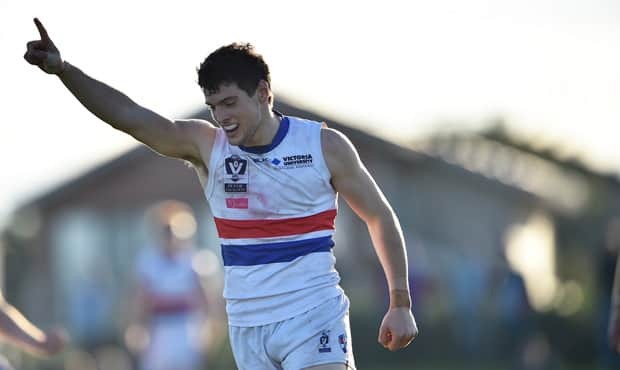 While Footscray led at every change, Williamstown surged back to the lead inside the final minutes, before Andrew Tashevski-Beckwith returned fire, goaling on the run to finish a counter-attacking surge. Coach Ashley Hansen praised his Bulldogs’ combativeness but was quick to pay tribute to his side’s opponents on the day as well. “I thought it was one of our best performances for the year and certainly it was off the back of Williamstown being a quality side so we have to acknowledge that, they’re top of the ladder for a reason,” he told westernbulldogs.com.au. “But the way we took the game on was just a credit to our guys. I thought we were really strong in the contest and for a majority of the day we had a lot of pressure around the ball. The match was tight from the start, but two skillful goals from Mitch Hannan in the second term set-up the Bulldogs with a handy 15-point lead going into the main break. “The message (at half time) was reinforcing what they’ve already achieved this year and how they’ve beaten really good sides and won really close games,” Hansen said. “So it was off the back of their portfolio of work, not me instilling it. Williamstown fought back in the second half and challenged the ‘Scray in a nail-biting half of footy. Snatching the lead at the 25-minute mark, the ‘Gulls put the pressure on and forced a fiery fight-back from the Dogs – which they delivered. Hansen praised the team for their efforts, but there were a few stand-outs that made their mark on the game when it really mattered. “I thought our high backs, Lynchy and Russ were really important in generating our ball movement. “I thought Jed Adcock was really good inside, he had a really combative day and tackled his heart out. The victory was inspirational and clearly meant a lot to the playing group as they belted out the Club song with gusto, shaking the walls of the away change rooms. “Beating Williamstown at Williamstown is always going to carry with it a little bit more weight, we don’t get any more points from it but to come here and atone for our performance against them earlier in the year when they beat us at home I think raised the satisfaction levels. “That’s a credit to Williamstown and where we hold them in regards to us and the VFL competition.’ Hansen said.